We were at a friend’s place for dinner last year where another guest regaled us with the story of a previous thanksgiving fiasco when he had been put in charge of roasting the turkey on the BBQ but instead of watching the bird, decided to work out instead. When he returned the turkey was burnt to a crisp and it was about 2 hours before their guests arrived. Wife was still at work and would not be amused. He ran out to the local grocer and paid waaaaay too much money for another turkey and long story short, they didn’t eat until midnight. I wanted to ask why he didn’t spatchcock the bird but that wasn’t the point… it was a funny story. But, seriously, why didn’t he spatchcock the bird? I cooked a 12 pound turkey for thanksgiving last year in 90 minutes. It’s not magic! 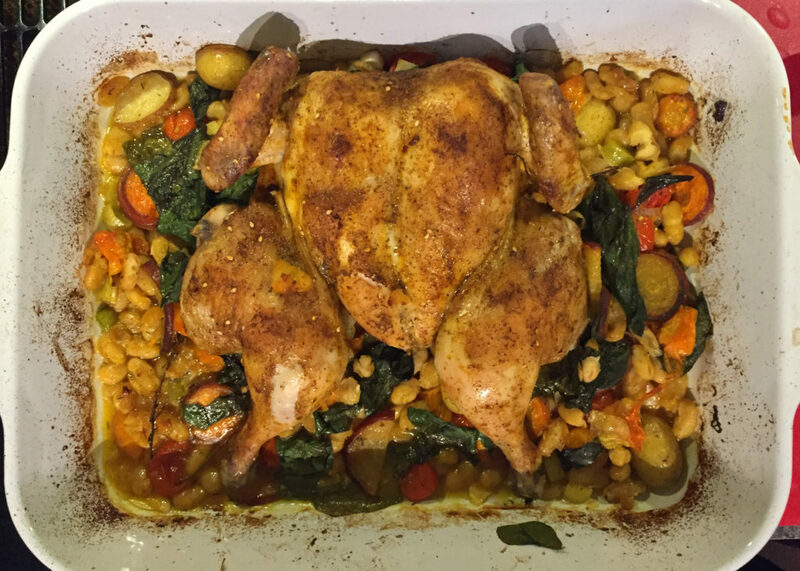 Spatchcocking (or butterflying) is a technique used most often for grilling but it’s ideal for roasting as well. A whole chicken or turkey in its natural form takes a long time to cook because the inside must reach a certain temperature to safely eat. The problem with this is the exterior (and especially the breast) often becomes overdone and dry before the inside is cooked. Opening it up and laying it flat by removing the backbone positions the breast at the centre of the meat which protects it while the darker meat takes most of the heat. It doesn’t make for a very amusing story, but it produces a heck of a tasty bird! The balance of this dish is really just another attempt by me to use up some of my garden vegetables along with another healthy filler… beans. My first thought was to use chickpeas which I think would be a great substitute, but I usually cook my chickpeas from dried (I think they taste better) so I didn’t have any canned in the pantry. I did however have some canned white beans. And, as always, use whatever vegetables are handy. Squash would be great, sweet potatoes, peppers, zucchini, brussels sprouts in the winter. You could substitute rosemary or sage for the thyme. It’s very adaptable. If you’re not using harissa as I did (which has a nice spicy kick), sprinkle over a few red pepper flakes as well. Place chicken, breast side down, on a work surface. Starting at the thigh end, cut along one side of backbone with kitchen shears. Turn chicken around and cut along other side. Discard backbone or save for stock. Flip chicken and open it like a book. Press firmly on breastbone to flatten. Sprinkle both sides with your rub and refrigerate for at least an hour, or overnight. 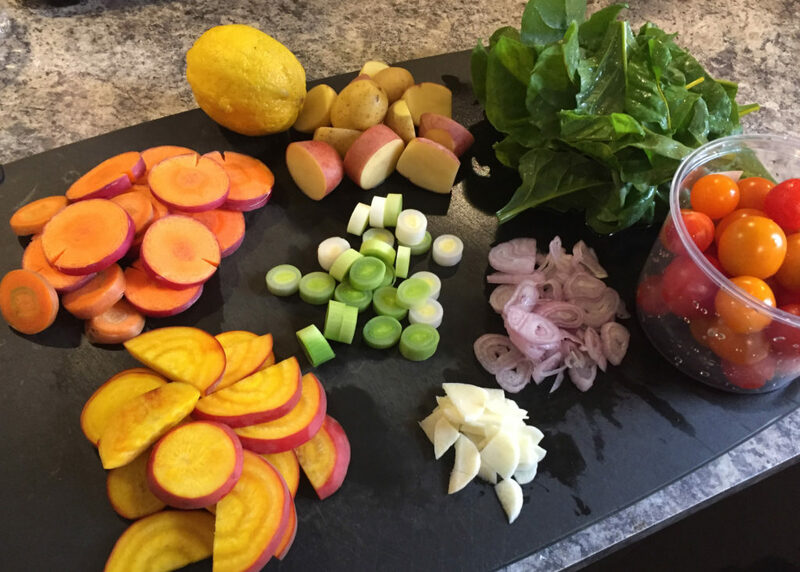 Separate veggies into two groups, veggies that take longer to cook (carrots, beets and potatoes) and veggies that don’t take as long (leek, garlic, tomatoes). 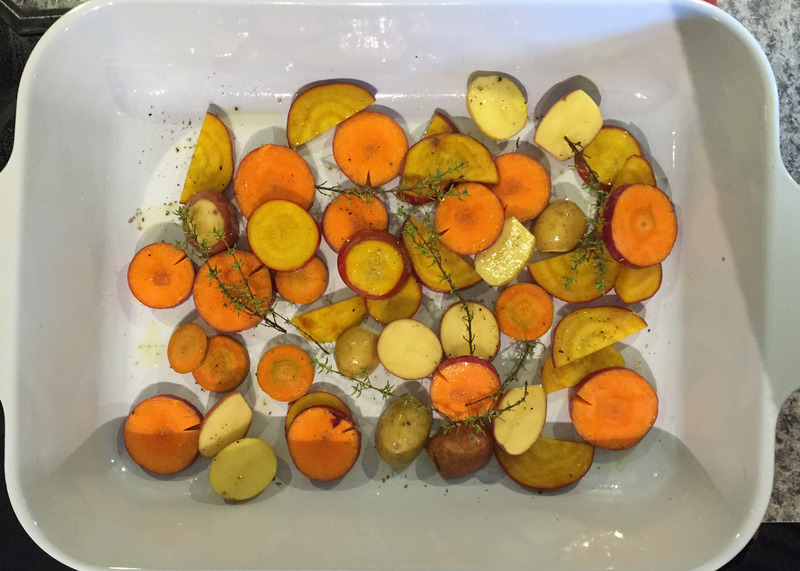 Put the longer cooking veggies in your cooking vessel along with the sprigs of thyme, drizzle with olive oil and season with salt and pepper. Roast in oven for 15 minutes. 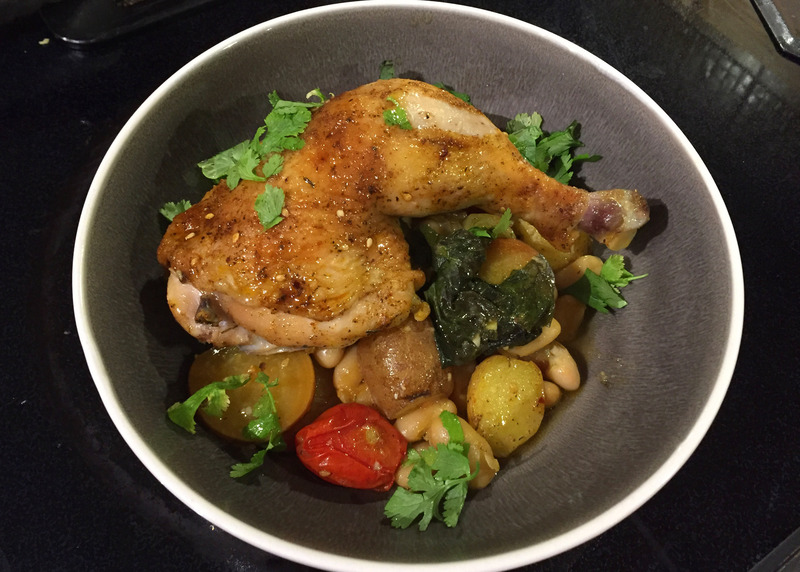 After 15 minutes, remove the pan from the oven and add the softer vegetables (except beet greens), tomatoes, white beans, and wine. Re-season with salt and pepper and stir. 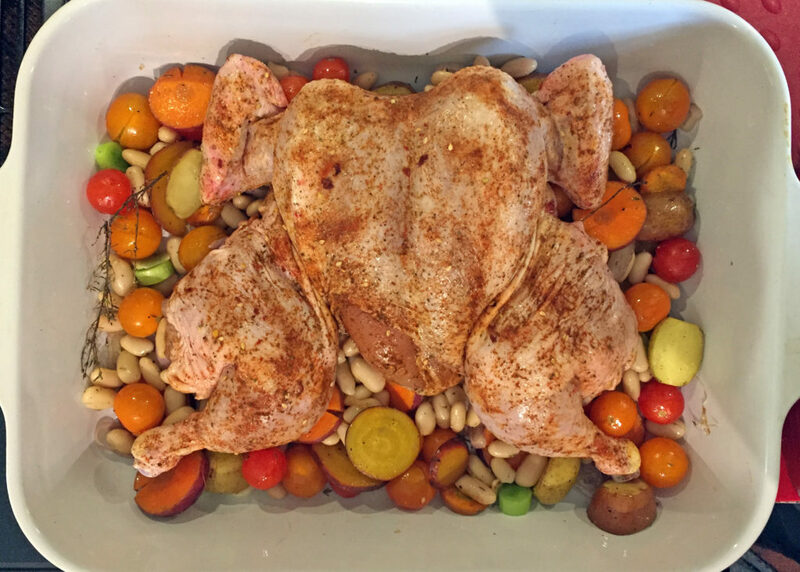 Brush or drizzle the chicken with olive oil and place, skin side up, over the vegetables and return to oven to roast for about 20 minutes. At this point I like to gently lift the chicken with some tongs and give the vegetables a stir to ensure they are cooking evenly. Return the pan to the oven for another 20-30 minutes, until the chicken is cooked through (internal temperature should be 165F). I check the internal temperature every 10 minutes and once it’s getting close, I stir in the beet greens. When the chicken has hit desired temperature, remove from the oven and let rest for 10 minutes. Cut up the chicken and serve family style or in individual bowls garnished with a squeeze of lemon and chopped cilantro.